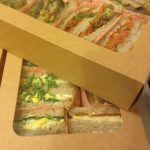 We offer corporate catering of sandwiches made with our great sourdough breads. Our fillings are all home made in our Leith kitchen with vegetarian and vegan fillings available. Our meat fillings are made with award winning organic meats from local farms including Peelham Farm in the Scottish Borders and Griersons Farm in Perthshire. 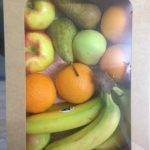 Our corporate catering packs also include cakes, organic fruit and fruit juices and selected bakery products. We make our cakes using left-over fruit from our cafes as a means of reducing waste. These include Rustic Apple, Chocoate Raspberry, Banana Loaf, Pear & Almond, Wholemeal Orange cakes to name a few. Please ask for our current list. 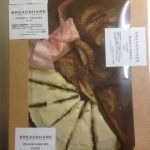 Email us at leithorders@breadshare.co.uk or phone us on 0131 538 4518 and let us know when you require delivery, how many people and any dietary requirements (we can meet various dietary requests – gluten free, dairy free, vegan, wheat free etc. just let us know). Please note, we will need your order at least 2 days prior to the event. Once you have confirmed your order we can provide per person price for your order.